Post-graduate teaching of Microbiology in our University was started in the year 2001 as a unit in the Department of Botany and Forestry with the help of Higher Education Department, Government of West Bengal. The unit turned into a full-fledged department in the year 2004. Infrastructural facility of this department is quite good. At present six faculty members are covering the said course in four semesters. Neat and clean lecture gallery, laboratory rooms, instrument room, faculty rooms and a big computer room with 24hrs internet facility fulfilled up to date standard of this department. 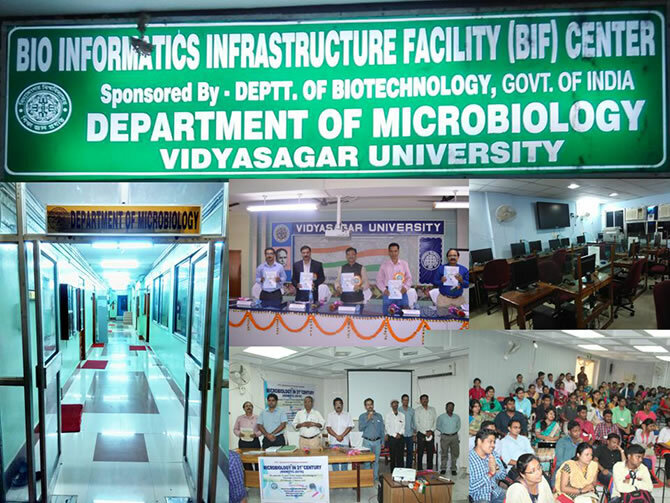 The Bioinformatics Infrastructure Facility (BIF) center has been created in this department with funding from Department of Biotechnology, Govt. of India, New Delhi. A large number of research projects funded by UGC, DST, CSIR and DRDO were successfully completed and two projects are currently running in our department. Every year a good number of research papers have been published in the journal of national and international repute by the faculty members. Recently a national seminar on “Microbiology in 21st Century” was organized by the department and about 193 participants attended the same. A quite number of students qualified for NET and GATE. Passed out students of our department are absorbed in different research laboratories as well as in industries. Our Department is also conducting an innovative course on PG Diploma in Quality Control and Assurance in Microbial Technology (QCAMT). The said course is funded by UGC since 2013 with an intake capacity of 20 students. We have included some emerging fields of biology in our revised course curricula. The fields are Nano-technology, Bioinformatics, Intellectual property right etc. CBCS mode of syllabus in M.Sc. course is introduced from this year.